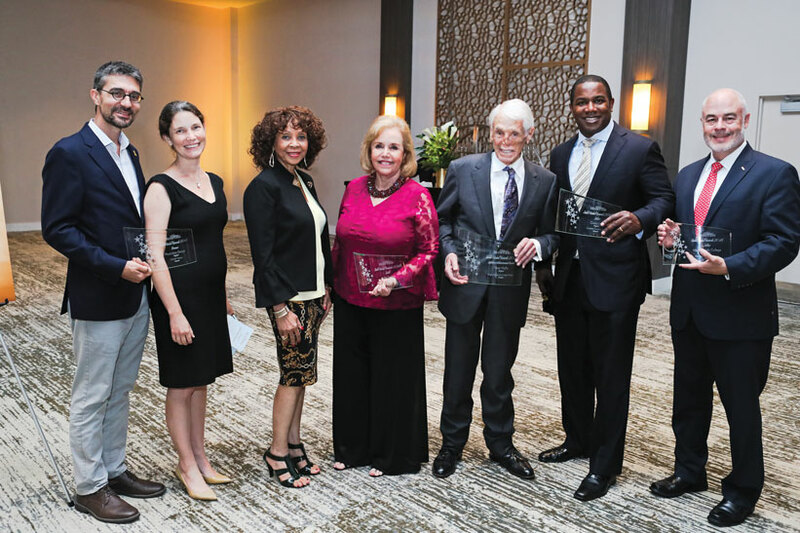 Three accomplished individuals and three prominent organizations accepted Gold Medal honors highlighting their outstanding contributions to Greater Miami at Miami Today’s Gold Medal Awards dinner. During the star-studded May 24 ceremony at Jungle Island that also marked Miami Today’s 35th anniversary, longtime development leader Tibor Hollo, the founder of Florida East Coast Realty, accepted the Lifetime Achievement Award for his multitude of past and current contributions to the community. Outside judges selected the Gold Medal Awards winners from among victors in local and national competitions last year – only top-level recipients were eligible to enter the Gold Medal competition. Miami Today and dinner sponsor Jungle Island, an ESJ Capital Partners company, chose and then honored Mr. Hollo as Lifetime Achiever. In balloting for the top organization, judges selected Swire Properties’ Brickell City Centre for the Gold Medal. The billion-dollar project in 2017 received the Urban Land Institute’s Vision Awards recognition as the project of the year for Southeast Florida and the Caribbean. Maile Aguila, senior vice president of residential sales for Swire Properties, accepted the award for Swire. Josh Moody, managing director and complex director for Miami, Naples and the Island Complex for Gold Medal sponsor Merrill Lynch, made the presentation to Ms. Aguila. Aida Levitan, the chairman of U.S. Century Bank, who last year received the InterAmerican Institute for Democracy’s Henry Dunant Award for Corporate Philanthropy, was honored with the Gold Medal for an individual. Aliette Rodz, partner in medal sponsor Shutts & Bowen LLP who presented the award to Ms. Levitan, noted her pride in honoring a Cuban-American woman who had achieved such stature. Miami Dade College won the Silver Medal for an organization based upon three honors that the college won in 2017: the Achieving the Dream Leah Meyer Austin Award for outstanding achievement in designing a student-focused culture, the top spot on the list of colleges and universities for Hispanics, and the Engaged Campus of the Year from the Florida Campus Compact. The Silver Medal was sponsored by Pinnacle Housing Group. Pinnacle Partner Louis Wolfson III, who was the presenter, learned after judges made their decisions that he certainly was no stranger to the winner. His grandfather, Col. Mitchell Wolfson, created the Miami Dade College Foundation and the college’s downtown Miami campus is named for him. Louis Wolfson III is a board member of the foundation and a major benefactor of the college, and in his presentation he traced the history of the college and his family’s long involvement. He noted that his grandfather had three aims in that involvement: “jobs, jobs, jobs” for those who would attend the college. Accepting the award was Juan Mendieta, the college’s communication director. The Silver Medal for an individual went to attorney Corey Lee, a partner in Hunton Andrews Kurth, who received the medal from Tom C. Murphy, co-president of sponsoring Coastal Construction. The Bronze Medal for an organization went to PlusUrbia Design, which last year was honored by the American Planning Association with its National Economic Development Plan Award for its redesign of the Wynwood Neighborhood Revitalization District. The firm also earned the 2017 Award of Merit from the American Planning Association of Florida for its guidelines for a new transit-oriented development for 300 acres in Hialeah. Presenting the Bronze Medal to PlusUrbia founder Juan Mullerat was Kasim Badak, CEO of sponsoring Okan Development, which is about to build Okan Tower on North Miami Avenue. The Bronze Medal for an individual was presented to Marie Gill, president of M. Gill & Associates, who received two major awards last year: The Woman in Public Service of the Year from the Minority Chamber of Commerce, and the Century Club Award from the US Department of Commerce Minority Business Development Agency. Marie Bertot, senior communication specialist of sponsoring Florida Power & Light Co., made the presentation of the medal. Tibor Hollo, by accepting the Lifetime Achievement Award, followed luminaries, chronologically, Judy Drucker, Adolfo Henriques, Merrett Stierheim, Phillip and Patricia Frost, Sen. Bob Graham, Aaron Podhurst, Arthur Hertz, Maurice Ferré and Jorge Pérez. Mr. Stierheim, Mr. Henriques and Mr. Ferré were present to applaud Mr. Hollo as the entire audience gave a prolonged standing ovation to the development veteran whose work has touched so many lives. Miami Today publishers Michael Lewis and Carmen Betancourt-Lewis noted that Mr. Hollo was the newspaper’s first landlord at 444 Brickell Ave. 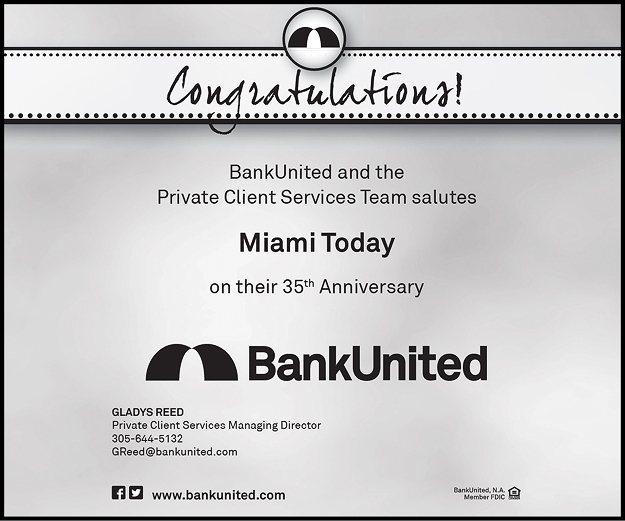 In fact, the day of the awards ceremony, the first residential rental tenants moved into Mr. Hollo’s latest landmark building, the 85-story Panorama Tower at 1100 Brickell Bay Drive. As Mr. Hollo’s wife Sheila and son Wayne, executive vice president of Florida East Coast Realty, listened, Mr. Hollo, obviously moved, accepted the Lifetime Achieve Award from Mr. Sitbon, Mr. Lewis and Ms. Betancourt-Lewis. Judges who selected the Gold Medal Awards were Tom Hudson, vice president of news for WLRN; Wendy Kallergis, president and CEO of the Greater Miami and the Beaches Hotel Association; Alfred Sanchez, president and CEO of the Greater Miami Chamber of Commerce; Mark Trowbridge, president and CEO of the Coral Gables Chamber of Commerce; and J. Antonio Villamil, founder and principal of the Washington Economics Group. 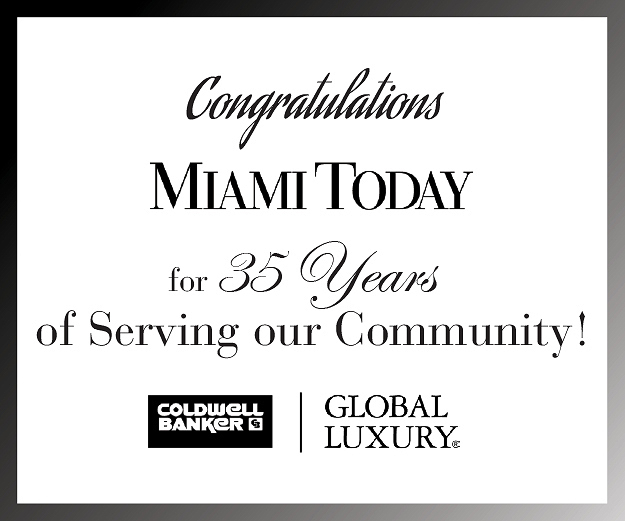 Miami Today 19 years ago established the Gold Medal Awards to honor The Best of the Best, choosing among honorees that already had received from peers top honors in the prior year. The judges, past Gold Medal Award winners, leaders in business and government, as well as an international delegation of consuls general, attended to salute the honorees. The event was held at Jungle Island on Watson Island just before the attraction’s formal re-opening after repairs following Hurricane Irma of last September. 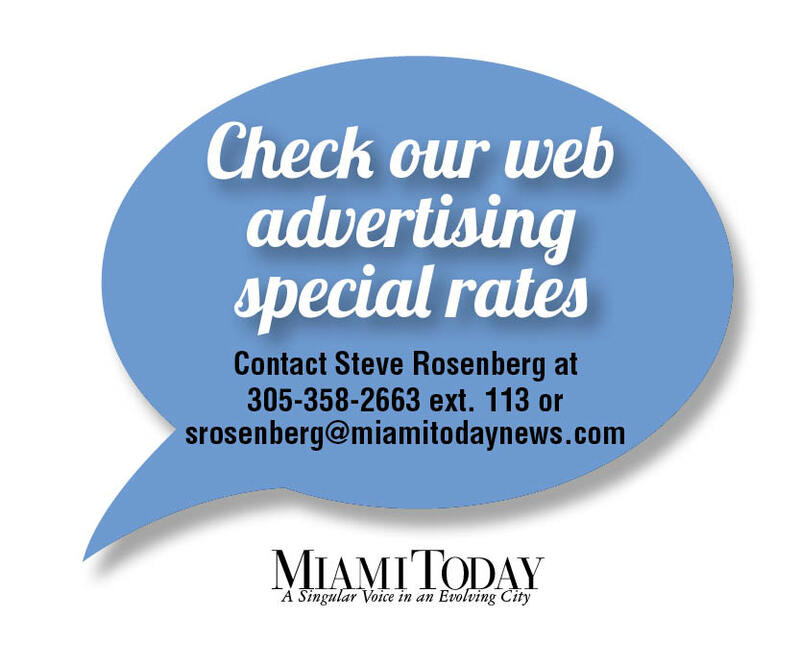 Changes included marked upgrades to the dining area and the entire facility as it prepares to add a series of attractions and seeks a new lease for an attached hotel, an issue that is to come before Miami city commissioners June 8. Former multi-term Miami Mayor Maurice Ferré, who attended with wife Mercedes, gave an impromptu plea to guests to continue to support with both subscriptions and advertising the quality journalism that Miami Today provides as he joined in the evening’s plaudits for the vision and achievements of Mr. Hollo and the Gold Medal Awards winners.